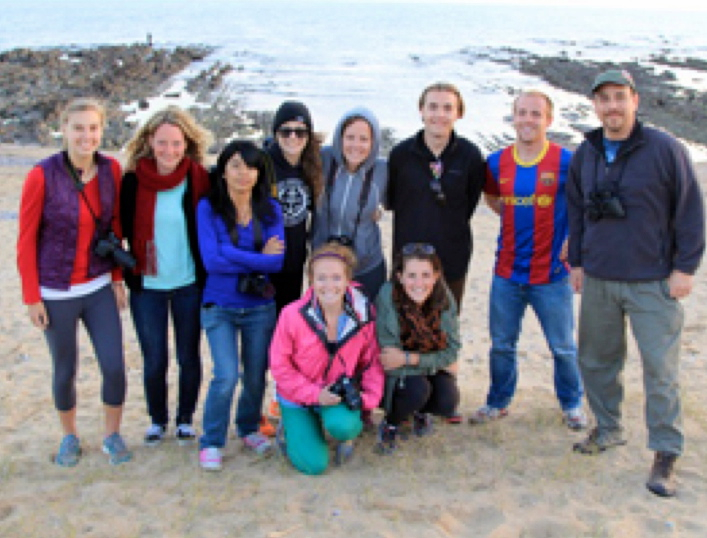 Eight University of Oregon School of Journalism and Communication students traveled to Uruguay for four weeks this summer as part of a new study abroad program to document the migration route of the Southern Atlantic right whale. The students gathered and developed multimedia materials and worked on post-production at host university Universidad de Montevideo. The program “Nature & Culture: Multimedia Storytelling in Uruguay” was created by Associate Professor Carol Ann Bassett. Joining her were SOJC students Julia Reihs, Brandy Dominguez, Christina Belasco, Carolina Reid, Michael Buisan, Kelsey Bradshaw, Meredith St. Clair and Casey Minter. The team embarked in Zodiacs to document 60-ton right whales, some of them mating and raising their calves, and conducted research into Uruguay’s efforts to protect its coastline from the threats of mega-development, such as a vast open pit iron mine and a deep sea port along the nation’s beaches. The program was done in cooperation with the Organización para la Conservación de Cetáceos, dedicated to the protection and conservation of marine mammals along the Uruguayan coast. The students’ work resulted in the documentary, “The Route of the Whale,” and several other videos focused on conservation issues in towns along the route. A highlight for Bassett came when the students attended a session of the Uruguayan parliament, sitting in the press box as invited members of the media. On the agenda that day was a proposal to create a whale sanctuary in Uruguay’s waters. The students are now preparing a website for their collective multimedia work.